*It was one for the books. 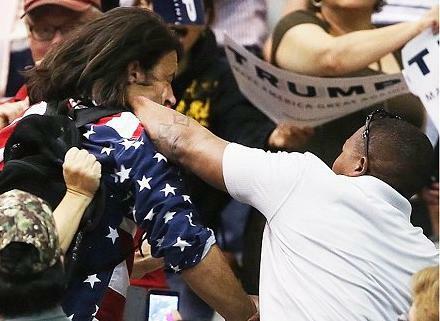 The sight of an African-American viciously assaulting a Trump protester at his Tucson campaign rally. The sight drew gasps and lots of expressions of puzzlement and disbelief. The assault came a few weeks after Trump’s photo-op meeting with some black ministers. He has also gotten some endorsements from an odd assortment of black names such as Mike Tyson. Before that he bragged that he could get lots of black votes. It drew guffaws and snickers since it was just Trump being Trump. The overwhelming betting odds were that Trump could do something that’s mathematically impossible and that’s top the percentage of black voter support that one poll gave 2012 GOP presidential candidate Mitt Romney during that year’s presidential election; namely 0 percent. Romney got his memorable 0 percent from black voters by doing what few GOP presidential tickets in modern times had done and that was to actively alienate black voters. He accomplished that feat with his plan to hack up Medicare, and Medicaid, downsize Social Security, gut the threadbare corporate and financial regulations, environmental protections, and their full throated assault on abortion rights that would’ve wreaked untold misery among African-Americans. Even more than Romney, Trump’s violence drive, race-baiting crusade that nakedly appeals to largely white lower income, less educated, rural and strongly male crowds drive the point home that blacks are not even an after-thought in his drive to snare the White House. But there’s more to the picture about Trump and black voters as the punches that the black assailant delivered to the Trump protester showed. The black vote in several ways is still very much a part of the GOP’s strategy and tactics to win the White House. GOP presidents and presidential contenders Nixon, Reagan, Bush Sr. and especially W. Bush took great pains to give the appearance that they were not overt racists, and that blatant racism was not part of their appeal. This included highly orchestrated, stage managed, photo-ops with black celebrities and sports figures, a handful of key black pitch men and women on the campaign trail with them, and in the case of Bush loading up the Republican convention with a pack of show piece, African-Americans to provide entertainment and perfunctory speeches. With Trump it’s is no different. Besides the handful of comic endorsements he’s gotten from blacks, he’s front loaded his traveling campaign circus act from time to time with two black women—the “Stump for Trump Girls,” a black minister or two, and panned audience shots of black faces sprinkled through his rally crowds. The next tact is not Trump’s but the GOP’s. That’s to refine the ploy of voter suppression tactics that the GOP has traditionally employed, in times past, from felon bans to blatant intimidation of black and Hispanic voters at polling places. GOP governors and GOP controlled state legislators will continue to drum up a maze of rules and regulations from ending weekend voting to the rash of voter ID requirements. 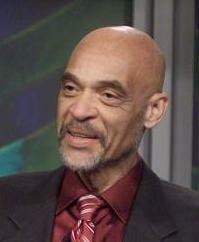 The aim is still the same to damp down the black vote total all under the guise of combating voter fraud. Then there’s Trump’s subtle racial pander, which like the GOP’s voter suppression arsenal of tricks, is hardly Trump’s creation. This is the GOP’s standard use of code words and attack points such as tax and spend Democrats, out of control, wasteful government, and welfare freeloaders. This embeds the notion that minorities, and especially blacks, unfairly scam the system with the active connivance of Democrats and at the expense of hard-working, overtaxed blue-collar and middle class whites. If Trump bags the GOP presidential nomination, the GOP establishment will be forced to throw in the towel on its low intensity civil war with him, and resort to yet another favored ploy. That is to bankroll and promote a handful of visible and vocal black conservatives to recite all the stock criticisms of Obama, civil rights leaders, and Democrats. It’s already got failed presidential candidate Ben Carson and the National Black Republican Association on board. This creates the deliberate and false impression that a substantial number of blacks don’t support the Democratic Party despite the polls. Trump and his black surrogates will pound on the tired theme that the Democratic Party has betrayed blacks and that it practices a modern version of plantationism; that is perennially taking the black vote for granted, while offering no tangible programs for the black poor. Trump will couple that line with his boast that he can put create more jobs for blacks and more affordable health care, and that private sector growth, school choice, and further shredding welfare, is the path to economic well-being and uplift for blacks. Trump’s aim is not to get any substantial support from blacks, since that’s an impossibility, but to sow seeds of doubt, confusion, and even a little hostility toward Clinton among just enough blacks to keep them from the polls in the must win battle ground states. Judging from the punches thrown by a black at the Trump protester, it may have worked in at least once case.